The Scouting Movement began in 1907 when Robert Baden-Powel organised the first ever scout camp on Brownsea Island in Poole, Dorset. Ever since and following in the inspiration of the series of books ‘Scouting for Boys’ scout campsites and activity centres have been established all over the world. Nine acres of woodland was purchased from the Coal Board by Mansfield and District Scouts for around £443.12.0. The woodland according to ordnance survey maps of the time was named “Blood and Guts Wood”, however the site was re-named “Robin Hood Scout Camp” because of the association with Sherwood Forest and the Mansfield District emblem depicts the legendary outlaw in similar surroundings. Yeoman Gate, was the name given to the main entrance to the site. It was donated by Mr Yeoman a local developer. 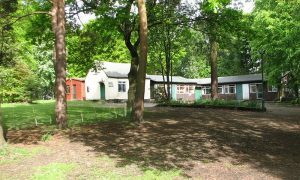 The Rover Den was opened on 14th July 1963 and was the first building on the site built by the local Rover Scouts. In 1974 leaders and Scouts from Mansfield and District dismantled old Gas Board office buildings in Derby, which were then re-erected at the site to form the main buildings on the site. Foundations for the main hut were old electricity poles. Although the timeline of the offices is largely unknown it is thought that there were in place at Derby for over 25 years before being moved to the camp site. Electricity was also installed to the site at during the 70’s. The toilet block was built by a contractor and the District Ventures excavated a cable trench to the toilets. The toilets were connected with electricity and wired by volunteers. The entrance drive up to the car park and headquarters was lined with trees, this was called the “Peter Mellors Way”. The chapel was built by the Rover Scouts and a number of members of Mansfield & District Scouts who have died are remembered in the Chapel. 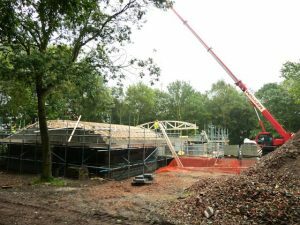 The roofed area linking the Rover Den to the main building and the new entrance to the main hut was one of the last things to be completed. In 1988 the Rover Scouts extended the toilet block to accommodate disabled facilities. Named after Mrs. Nora Parks, who was ADC Cub Scouts in the District for many years Parks Cabin was a later addition to the site. Betty’s tuck shop had become a well-established part of the site with its own cabin. During this time, the camp fire circle was refurbished, the wood pile moved to its current location, the car park was extended and secure fencing was erected around the perimeter of the site. Sustrans Cycle Charity purchased a strip of land along the west boundary of the site to create a cycle route. In 2007 to celebrate 100 years of Scouting Mansfield and District Scouts held a district camp on the site for 400-500 people, one of the largest camps ever held at the site. 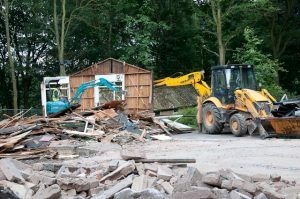 After much fundraising and generous donations from grant funding the most of the old buildings on the site were demolished to make way for a brand-new activity centre building. The toilet block still remains. Phase one of the new building was opened in March 2011. 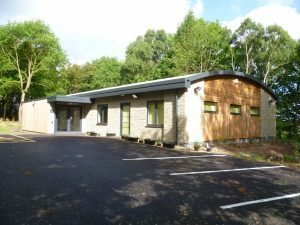 Although only phase one was completed the centre can sleep 24 people in bunk bedrooms, provides a commercial kitchen and large activity room. An office / shop area was also built into the main building. The toilet block was also given a refurbishment and a new sewage system installed. 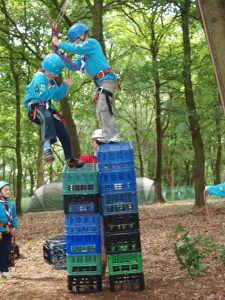 The activities on offer at the site were given a major boost when donations from the family of Dave Huggett a leader from Mansfield and District Scouts, allowed for the purchase of crate stacking equipment. Since then activities have grown to include archery and bouldering.